Summary: This wonderful walk is best done in late spring. I did it on the last weekend of May on a sunny day when the hawthorn blossom was at its very best. This benefit added to a walk that is simply fantastic and if you're not blessed with spring then don't be put off for the walk is to be recommended at any time of year. 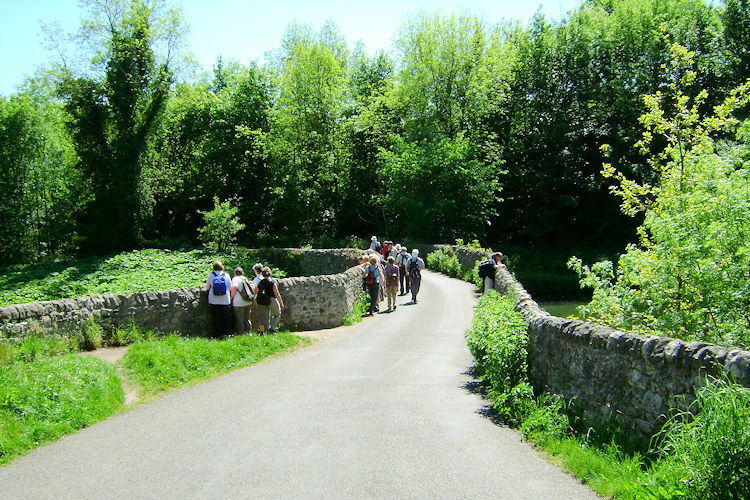 The route is rich in diversity with a beginning over wide open expanse before descending into Lathkill Dale, one of the Peak District's finest. Then there is unsung Bradford Dale to walk through, absolute joy that provides a fitting finale to a marvellous walk. The Walk: My wife Lil and I were visiting her son Chris for the weekend. She was quite nervous because it was to be our first meeting with his girlfriend Emily's parents. I was not nervous, the meeting was in the evening and while Lil continued on to Upper Tean to calm herself over lunch with Chris and Emily before the evening event I asked her to drop me off in Middleton so I could do the Lathkill Dale and Bradford Dale walk. 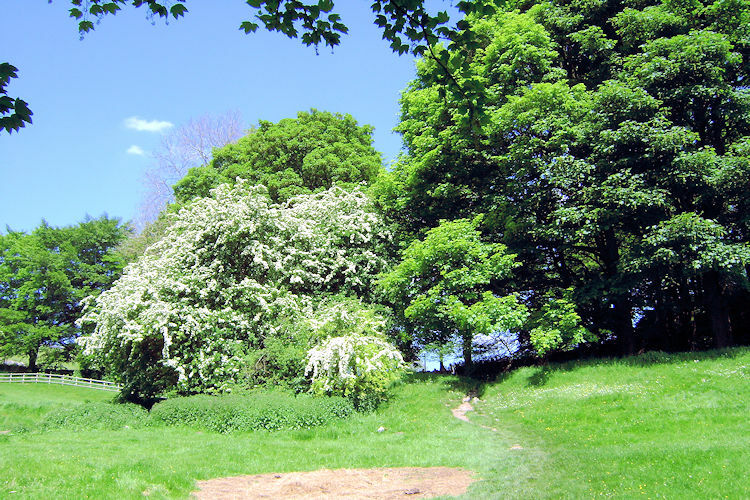 It was a beautiful spring day and earlier in the day on waking to brilliant sunshine in Harrogate I rummaged through my walking books to find a suitable walk not too far from the route to Upper Tean. I was so fortunate to find this gem. As per our last minute arrangement Lil dropped me off in the centre of the village and I bode her a temporary farewell. I walked from Middleton along the Youlgreave road for a kilometer until I reached a sign for the Limestone Way. The sun was blazing down and I welcomed the cover the tree lined road gave me but once I left the tarmac highway I was immediately bathed in sun. It was a scorcher of a day and on leaving the road the walking was uphill quite steeply. I was soon sweating and having to take regular breaks to swipe the excess from my brow. The scenery was fantastic though so the short breaks were enjoyed and as I made height the views began to become more extensive. I was in pure joy walking over lovely upper Peak District land. After just over two miles I reached Calling Low Farm, at 320 metres the highest point of my walk. From here the views were tremendous and I came across a few groups having picnics, lucky people on such a splendid day. After passing Calling Low Farm I headed down towards Cales Dale. 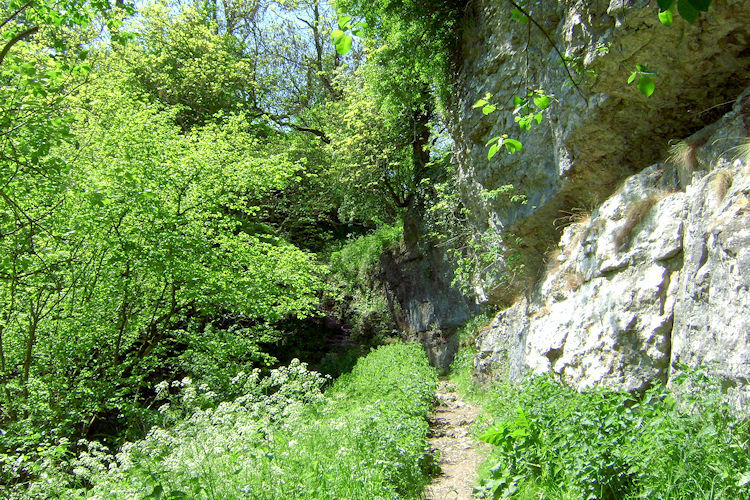 Cales Dale is one of two smaller dales that are the creation of Lathkill Dale. The other is Ricklow Dale which I am to pass a little further on. I did not pass Cales Dale though, I descended steeply into it and then I immediately ascended steeply out. It was a tough little passage through Cales Dale and going thorough I did meet two couples taking breaks on the uphill part. After Cales Dale I emerged at One Ash Grange Farm, still gasping to recover from my short tug up Cales Dale as I passed through. After the farm I turned right off the Limestone Way. 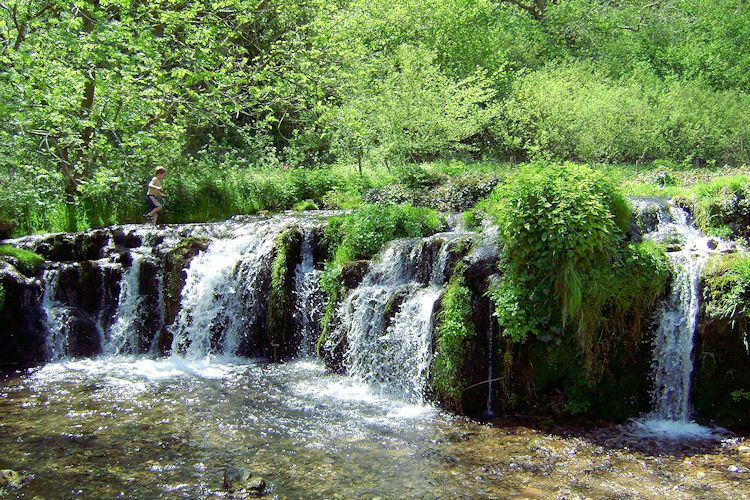 To continue on would take me to Monyash which was not my next objective, it was Lathkill Dale. I walked down the short but ever quaint Fern Dale into Lathkill Dale at its high point just east of Monyash. My walk through this Peak District treasure had begun. The first mile heading east along the Lathkill was on a dry dale and only after I had passed the junction with Cales Dale did I spot the first signs of ground water, not water itself but lush high grasses and damp loving flowers. I knew water was not far away and soon after I heard a trickle of water. A few steps later there was a stream running beside me, the River Lathkill had appeared. The river soon grew from a brook to a flowing river, shallow but wide. 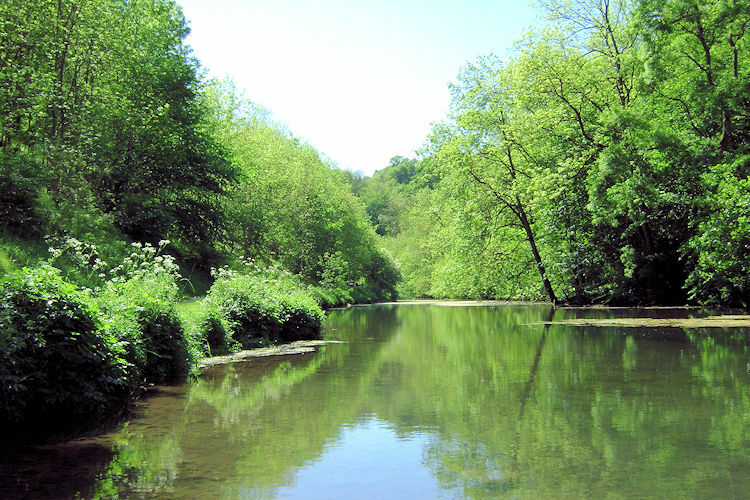 The water was crystal clear and perfect just as described by Charles Cotton "by many degrees, the purest and most transparent stream that I ever saw, either at home or abroad, and breeds, it is said, the reddest and best Trouts in England" in 'The Complete Angler'. As I walked downstream I ventured on groups of people, many of them families with children who were enjoying paddling in the clear waters of the shallow river. Every now and then I passed small waterfalls and man made weirs, all magnets to the youngsters. They were not a hindrance to me though, it was lovely to see children playing freely with the best nature has to offer in these days where computer gaming, web blogs, cellphones and street corners seem to take up all young time. 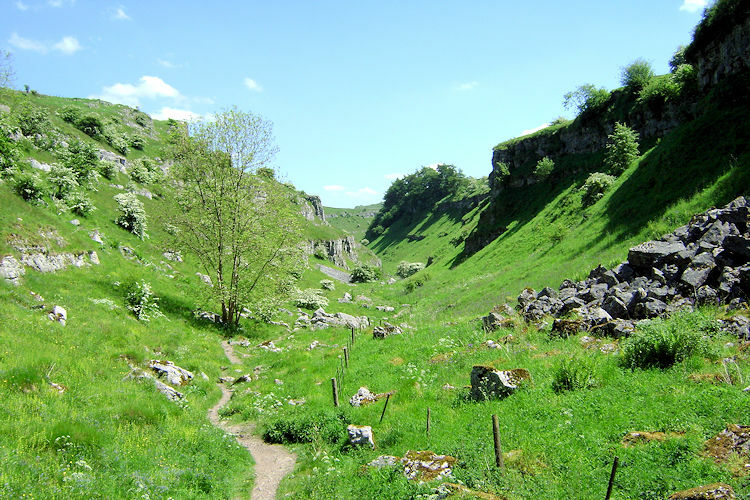 This free spirit adventure in Lathkill Dale was better by far. 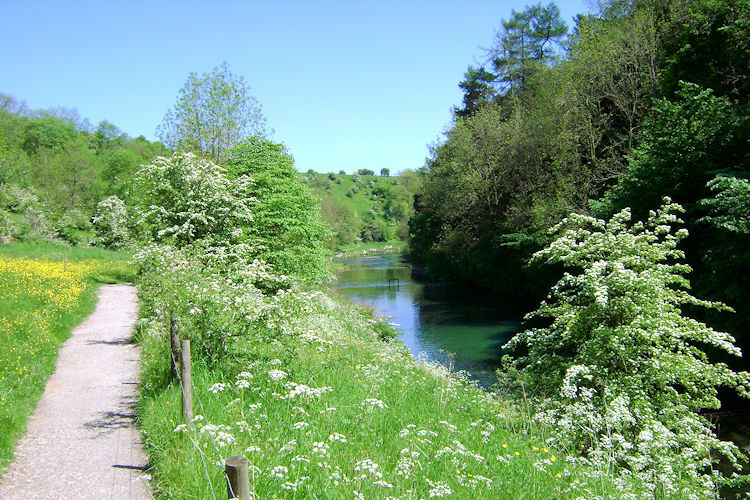 I continued along Lathkill Dale and as I did so the river matured into a calm flowing thing of beauty. Still retaining its clear waters all along the dale it widened and in places deepened but it was never threatening. 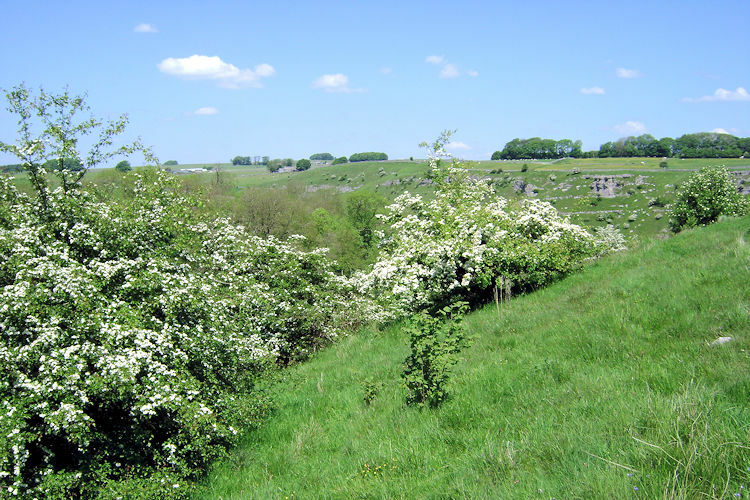 The flora along the dale was magnificent with lush grasses, more blossomed hawthorns and other trees of many varieties. I walked through Lathkill Dale for four miles until I reached Conksbury Bridge where alas I had to leave the riverside and cross a couple of large fields and then along Dark Lane, all adjacent to the dale which took me to Alport. From Alport I left Lathkill Dale altogether, a sad parting and then crossed fields adjacent to Bradford Dale. I was itching to get alongside the River Bradford, I had read in my guide in the morning it was a special place. I eventually reached Mawstone Lane, the road linking Youlgreave to Elton and on crossing it I followed a lane down to the River Bradford. Then I was in heaven again. The walk along the River Bradford towards Middleton was just as delightful as my encounter with the River Lathkill and in fact a little more intimate for the path, particularly the final section from Youlgreave to Middleton, was right alongside the river, one as clear as the Lathkill. The river was full of trout, all serenely enjoying themselves in the lovely sunshine, all idly drifting in the peaceful waters. 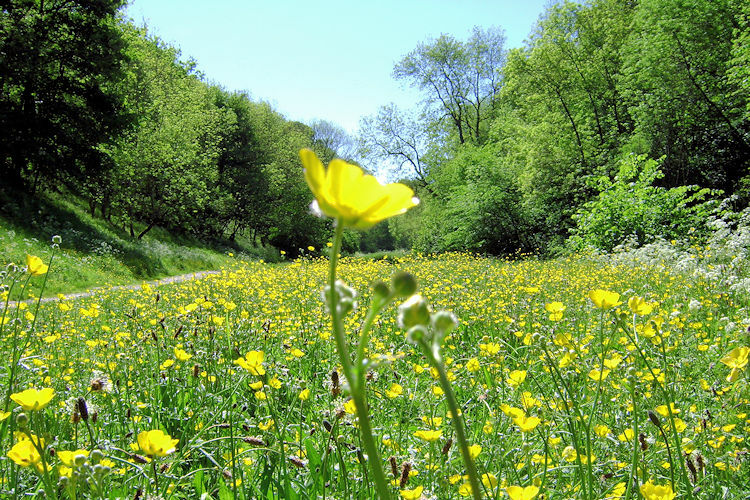 I watched them constantly as I walked along the path only to be distracted by the profligate buttercups and canopy of the trees rising from the dale into the skies. 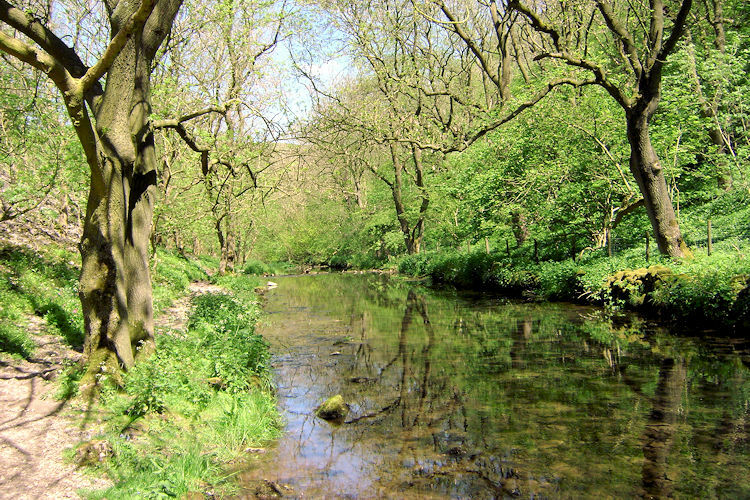 I loved my walk through Bradford Dale and was reluctant to leave, even more so Lathkill Dale. But leave I had to. I had a rendezvous with Lil in Middleton village. We were meeting the new in-laws in the evening, two new acquaintances. I had already met two new dales this day, two special dales, two special acquaintances.